Mansfield Town v Barnet. 'Alex Iacovitti in first half action at the One Call Stadium on Saturday. 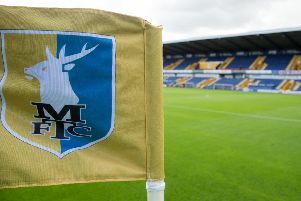 Mansfield Town manager Adam Murray was delighted with loanee Alex Iacovitti’s debut in Saturday’s 1-0 home defeat by Barnet. The Forest loanee had a fine game in the Stags’ defence and as he prepared his players for the trip to Hartlepool this Saturday, Murray said of the 19-year-old Scot: “He was outstanding, top drawer. “We started him off on that left hand side and I thought his distribution was outstanding. “I said before the game he is a kid in a man’s mind and body. “He’s an aggressive little so-and-so, but he can play. “I felt the balance of the side was really good and when we had to shift it around it threw us a bit for five or 10 minutes. Murray understands some fans want to see the club’s own youngsters given an opportunity but tried to explain the gulf in class between the Forest youngster and what was in the building right now. “You have to understand this 19-year-old kid has been at one of the top academies for 12 years. “He is an international and he has played in the Championship at 18. “We have very good kids here, but they are probably a year or two behind as they haven’t had that education from 10 or 12 building up. “They’ve come from the local Sunday team and, with all due respect, it’s not the environment a top academy gives you. So we have to be a little more patient with our kids, though they will come.